In March, the Friends Workday volunteers were joined by Cardiff Conservation Volunteers (CCV) to clean out the top silt trap in the upper part of the Park. 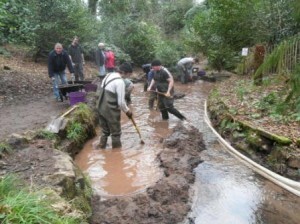 The silt traps in Cefn Onn are very important for filtering the silt out of the streams so that the main ponds do not get clogged up. Unfortunately these traps have not been cleaned out regularly in the past and both the main ponds in the upper and lower parts of the Park are relatively silted. Our first task is to prevent further silting (by ensuring the traps are regularly emptied) with the prospect of maintenance on the main ponds when this is possible and funds permit. Thank you to the volunteers and CCV for their hard work digging and barrowing during the Workday.